And then there are those which don't seem to fit ANY kind of category! I love them - they're beautiful cards. Some absolute stunners on your list Alan! Thanks for flagging those. For what it's worth guys here is the Sharpe's that I got 6 months or so ago. Met a nice chap called Bill Duerden from Burnley at Timperley once, who was a Baines expert, but that?s a goodly while ago. I know the chap who ran the Timperley club until just recently, John Drew. 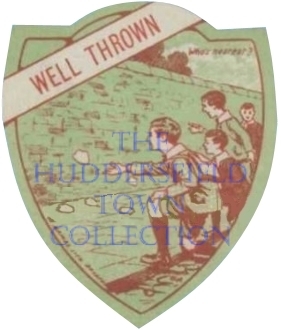 Big HTAFC fan and collector. I had no idea that they were issued this early, they must be some of the earliest cards issued. Clearly a topic worth research, am not sure what you mean by multiple issuers/ printers, is the term Baines cards generic or a particular firm or person who used multiple printers. I know nothing on this subject. 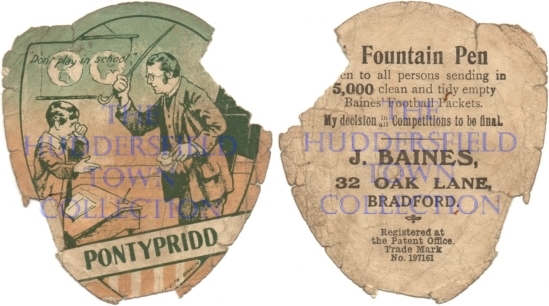 I can see that Baines is from Bradford, from the reverse of some of the scanned cards, what was he promoting, were these free with a product or were they purchased at sporting events or even given out promoting his business. Do we even know what his business was? If I was a sport enthusiast these are what I would collect, the scans are so good and the information on the backs indicative of his business. More scans please and more information. 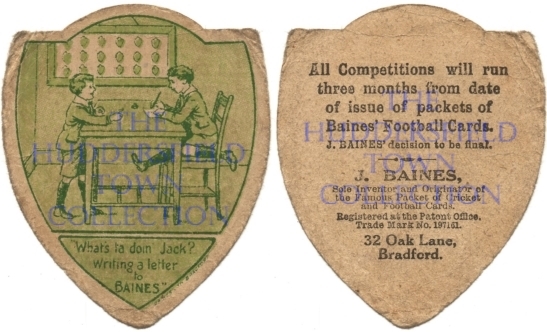 This used to be a good history on John Baines and the cards he and his company had printed. Not too sure if it?s up to date or links still work properly. It has been said already, there aren?t any definitive lists of what was produced. There could be 6000 different cards issued, 7000 even, nobody really knows. No one kept records like they did for cigarette cards. I have two Brentford J Baines cards (with two players named A.S. Ling and A. Bartlett) and seen three others (G. Reid, ?Hands? and a cricket ball). One of the cards that I have, and purchased recently, hadn?t been seen before. How many more are out there or printed? We haven?t a clue! Their values range enormously too. Some can be ?5/?10 while others could command ?150/?200. It all depends on the subject. From this anoraks point of view, what appeared on the backs of the cards was just as important as what appears on the front. BTW - this is my favourite ?Baines style? card, but it was issued by Sharpes and is 3 3/4? in diameter (or 12cm for any young folk). Incidentally, amongst the players is George Ross, who captained our record 6-0 cup winning side of 1903. I will scan the card as soon as I can. I am really impressed by the Sharpes team issue...not many of those around I shouldn't wonder. I wonder what the print run was on these types of issues. Anyway what is clear, not many survived..
A lovely card, do you have any idea of the date going by the players featured on it? I've always thought of W.N. Sharpe cards as being issued in 1880's and 1890's.